Horseback riding can be a nerve-racking experience for first-time riders, but there are techniques that can help you overcome the anxiety and relax in the saddle. Horseback riding can be both an exhilarating and nerve-racking experience, because working with live animals requires a certain level of patience and expertise. But when done right, this activity can be relaxing, rejuvenating and therapeutic. Many studies have shown horseback riding to be beneficial to cognitive and psychological processes. Furthermore, you gain a greater appreciation for the dynamic and symbiotic relationship formed through working with such amazing creatures. 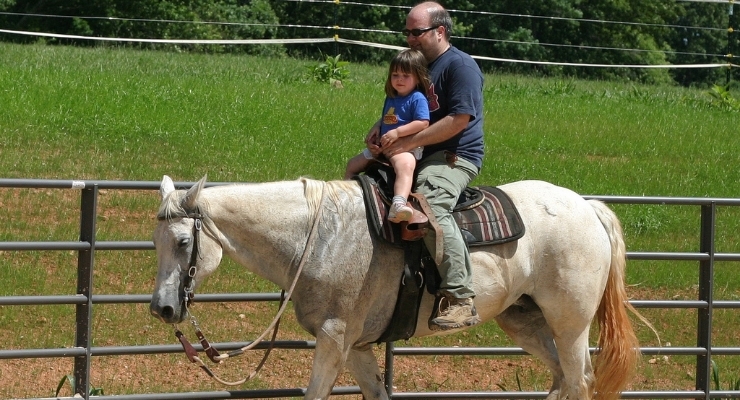 As with any newly acquired skill, horseback riding requires instruction and practice. Here are 5 common problems that beginning horseback riders experience and tips on how to overcome them. 1. The horse seems unapproachable or aggressive. Some horses feel apprehensive when approached in a straight line. When approaching, try walking in an arc toward the horse — the goal is to make your presence known. Avoid direct eye contact, and be sure that the horse is facing your direction. Finally, when in close enough proximity, establish a rapport first by extending a hand for the horse to smell. Pet the horse gently prior to hopping on it. This will help develop a closer initial bond between the 2 of you. 2. You are having problems mounting the horse. Horses are typically trained to accept riders mounting on the left side, so be sure to follow this rule accordingly. If the horse is moving, allow it to move and find a balance point. Don’t force it to be still — instead, try to control the direction in which the horse is moving. Make sure to distribute your weight evenly by pushing down on its opposite shoulder when mounting, as opposed to having your weight hanging from 1 side. 3. Once riding, you feel insecure or wobbly on the horse. This is most likely because of incorrect positioning and seating alignment. The rule of thumb is that proper riding posture should allow for a straight line to be drawn through the rider’s ear, shoulder, hip and heel. Your shoulders and back should be straight, and the widest part of your feet should be positioned in the stirrup. 4. The horse does not stop when you pull back on the reins. Stopping is a combination of verbal cues, body positioning and rein movement. Start with a “whoa” call, followed by a halt cue of closing your fingers and pulling backward on the reins in conjunction with pushing your seat deeper into the saddle. 5. The horse bolts or is going too fast and is unresponsive to halt cues. In situations such as this, it may be necessary to use the emergency stop technique to regain control of the horse. While holding the reins tightly in both hands, pull on 1 side until the horse’s head turns — forcing him to slow in a circular motion. This “emergency brake” is called the 1-rein stop, and can effectively allow the rider to regain control if the horse is bucking or going too fast. If the horse is completely out of control and running extremely fast in a straight line, a sudden pull into a circle turn could be dangerous. Like people, horses have varied personalities. Some will be more well-mannered, whereas others may take a bit of warming up to and will be less receptive to commands. Being calm, well-mannered and not overly aggressive is always a general rule of thumb to keep in mind for the beginning horse rider. Horses are highly intelligent, but they are also shy by nature and can spook easily. Successful horse riding is a combination of learning the proper skills as well as the ability to work with the animals effectively. This article was written by April Jacobs, a writer and avid traveler. April graduated from the University of Alabama with an English degree and writes for travel publications. Getting paid to explore the world has made for some interesting stories. Occasionally, April writes for C Lazy U Ranch.